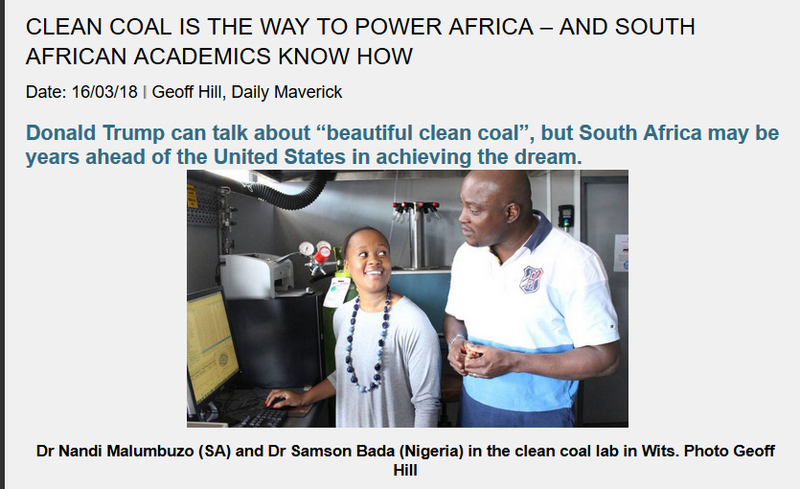 Professor Rosemary Falcon (see article) together with chemical engineer Dr Nandi Malumbazo from Wits, Dr Samson Bada from Nigeria, along with Dr Jacob Masiala from the Congo are working on ways to get the lights on in Africa and keep the air clean. the other colours denote other type of rocks. 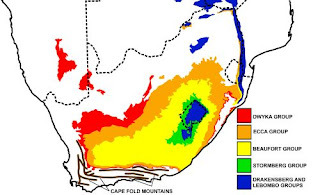 ... South African coal was formed at the end of an ice age burning longer and at a high temperature - while the coal in North America came from hot steamy swamps and burns rapidly. 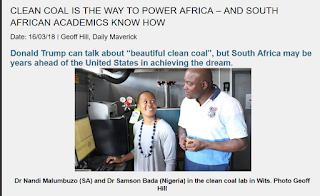 I just found the article so interesting ... with all the talk being against coal ... their research seems like a positive way forward for Africa - but very possibly for other countries around the world. very interesting. I think any fuel can serve a purpose as long as it is used correctly. Scientists and engineers keep arriving at new solutions. Hey Hilary! You've finished the A-Z! Wow! I haven't read many of your posts but I will work my way through them. 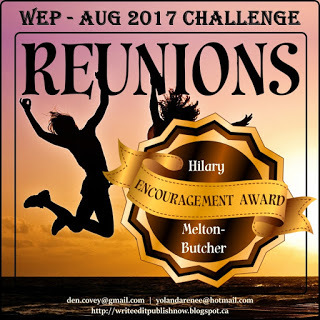 Been busy with WEP this month as you know. Yes, I know there are different types of coal. Oz has clean coal and also some less clean brown coal. We export our clean coal overseas so others can have their lights burning, but our government is phasing out coal (even though Oz is built on it...it's everywhere!) and moving into renewables. At this early stage, moving away from coal too soon, the lights often go out in some big cities. Our home is completely off grid with solar, batteries and 2 wind turbines on our roof. How cool is that? Thanks so much for your post Hilary. We have some clean coal here, as Denise flagged in the comment above. However I believe that it is much more expensive to build clean coal facilities. I see that expense as an investment though. And hooray for renewables. And questioning minds. Clean coal sounds better than the dirty sort – but extracting it must still cause environmental damage and burning it still pollute? It will run out too. It seems a shame that investment and development isn't focussed on sustainable sources such as solar (I don't just mean in Africa, but everywhere). That's interesting Hilary, clean coal would make quite a difference to many areas of the world. Not heard of it before. What an interesting post Hilary. Cleaner hotter coal, formed under different conditions than North American coal - how fascinating. Interesting about your coal - and I know your govt is looking at its energy sources ... I do hope it doesn't mess the environment up and makes some sensible choices re renewables. 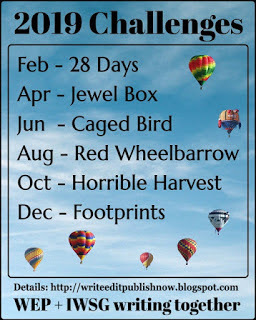 @ Susan - thanks .. thought you'd like the Wits bit! Yes SA with its sun should be able to supply a degree of energy ... and the research facilities in SA are very good - despite the Zuma-Russian desires ... thank goodness for your two women stopping the nuclear deal. Congrats to South Africa! It is the way of the future and no longer an impossible expensive approach to coal mining. I know it's the rage over here, too. Thank you so much for bringing this story to #WATWB. I don't believe many of us know or understand what it would be like to live without electricity...no ovens or microwaves, no coffee pot, no TV...everything we take for granted. I hope that many more Africans are given the power of power in the near future. What a difference it would make in their lives. I didn't know there was such a thing as clean coal. Scientist keep improving things. This was very interesting, Hilary. Coal that can melt an industrial boiler? I'm really glad to hear some good news from Africa. Very positive, indeed. Z? Are you finished? Can't believe April is already at the end. I honestly had no idea that there were different type of coal and that they each burn so differently. Fascinating. This makes sense now that I think about it. I learn so much here. :) Thanks! And here I thought "clean coal" was an oxymoron. I'm very much in favor of more light in this world, and for the people of Africa being able to enjoy the blessings of electrical power! Thanks for sharing an interesting article! @ Lee - I know sometimes the things we're told about amaze me ... and make me look at things in different ways ... and yes, the good news here is so encouraging. Z has been done and duzted! @ Debby - sort of surprised me too - hence the post: clean coal ... let's hope it happens. That is a lot of people possibly without power, wow. Never knew there were different strengths of coal. I had no idea there were different types of coal in the world, but it makes sense and I'm happy to hear there are people trying to make proper use of it. What an important change it could be for Africa. Well, this post was an eye opener. I had no idea there were differentials in coal or that there was a clean coal. Very interesting. And wow, that is a hot coal! That was an interesting article, I am not sure about coal though. The important thing is that science is trying. 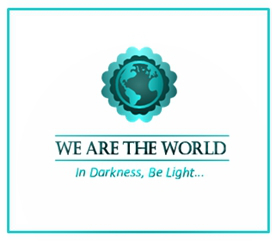 If it can help bring light to places of darkness then there is hope for the future. @ Pat - yes there are a great number of people without power ... so I was so interested to read about this project. @ Andrea - took me by surprise too - and any help to get Africans powered up will so improve the economy of their families, as too the country .. I think it's wonderful that research is being done on helping fuel like coal to be more efficient and I'm with the people of Africa in their desire to have electricity. But coal is still coal and Solar energy really is the most sustainable. I'm fascinated with this new information I gleaned from your blog - about coal that is so high in energy it would melt an industrial boiler. Amazing, isn't it? Thank you for writing this. This is great news, Hilary. I really wouldn't have thought we'd ever have "clean coal" so it's good to read of this research. I hope they are successful. I agree with you that everyone has the right to power and the opportunities it provides. More power to them! Any fuel can serve as a vehicle for growth so long as it is eco-friendly. Glad to see work being done on electrifying Africa. Can you imagine living without power? That blows my mind. It would definitely be simpler in some ways, and so much harder in others. The difference in burning temperature... Wow. Here's hoping they are able to implement a clean-burning system. @ DeeDee - good to see you ..
@ RO - I was so interested to read the article ... as you mention it reminds us that we are so lucky to be living as we do today, while others struggle on a daily basis. We are spoiled in the US. Electricity and available water mean everything to civilization. Their goal definitely sounds better and it can bring them so much, too. It's amazing what we take for granted in the States. What an amazing amount of research they are doing. I truly hope that this can come to fruition. They need to have power that's not only reliable but affordable too. How exciting, as long as it's done with the environment in mind, it's a great thing! Wonderful article! Very interesting! It makes sense that coal from different parts of the world would have different characteristics, but I'd never considered it before. The idea of "clean coal" has been floating around for many years, but I'm glad to hear it's becoming a reality. Too bad it's still so dirty and unhealthy for the miners. Interesting stuff, Hilary - but I am very suspicious about claims for “clean” coal. I would have immediately been against coal too, but this sounds fascinating and brings new hope. Thanks for sharing! Have a lovely weekend, Hilary. Hi Hilary :) I too have faith that our scientists and inventors will come up with something more eco-friendly. Something has to be done, so it will. I am equally sure there is already something better out there, and all the money makers just have to decide to implement it. World changes are not easy. Very nice to know about the coal in Africa! What an appropriate and encouraging post, Hilary. Good find for "light-bringing" news! Hilary, hope your weekend is filled with sparkle and sunshine. I think about Africa often, I've read books about Africa all my life, but I never thought about the lack of electricity there. So glad some bright and thoughful people are working to fix this. And, again, thank you for this. Reading your blog is like going back to school -- in a very good way. @ Inger - yes ... Africa - me too! We so often don't think about how others are living in the really poor parts of the world - yet scientists and researchers have over time helped to improve life for us all - it just takes forever to reach the poor. Thanks re the blog reading ... just so glad it's in a good way - that's what I'm aiming for ... posts that people will appreciate and learn from. This was outstanding! I'm so glad you shared it. Africa seriously needs a hand-up on things like this. Electricity to me is the most basic and important of utilities. I have relatives that live in Congo and they frequently use solar panels to help generate it...but it's tough. So interesting but wouldn't it be cheaper and cleaner to use solar energy? I live in West Virginia and we are a big coal producing state. I remember when I was a kid, there would be the yellow smoke coming from the power plant stacks, but that's now gone with scrubbers in place and such. I'm sure it can be made even better. No sense abandoning it if it can be used to make the lives of people better. It's rather stunning to think some folks are still living without power isn't it?